Mr. Sequeira is a management graduate from XLRI and has had around 30 years of industry experience. He currently heads the Bulk Carrier Division of the company. 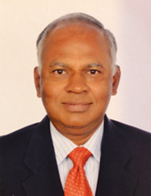 Before joining Great Eastern Shipping in 2006, he has worked with companies like Shipping Corporation of India, Chowgule Steamships in Mumbai and KCMA and Noble Chartering in Hong Kong. Great Eastern Shipping is a 70 year old shipping company currently operating 47 vessels and 2 second purchases to be delivered. The Company's current fleet includes 32 tankers(12 crude carriers, 17 product tankers, 3 LPG carrier) and 15 dry bulk carriers (1 Capesize, 8 Kamsarmax, 6 Supramax) with an average age of 10.37 years aggregating 3.88 mn dwt.